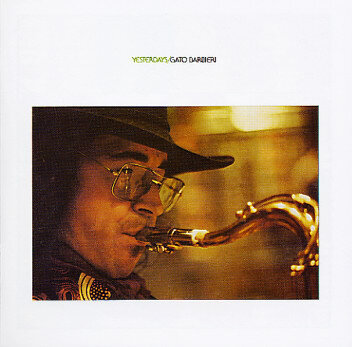 A beautiful record from Gato Barbieri – almost a return to more traditional forms, but still graced with the searching, burning quality that made most of his early 70s sides so great! The tracks are all long and exploratory – and have Gato blowing with that tremendous tenor tone – a mix of late Coltrane and Pharoah, with some warmer, sentimental touches that really send us. The rest of the group includes George Dalto on electric and acoustic piano, Pretty Purdie on drums, and Paul Metzke on guitar – and most of the tracks feature added Latin percussion – not too much, but just the right amount to make them bounce along in a rhythmic groove. Totally great all the way through, and with tracks that include “Carinoso”, “Marnie”, “A John Coltrane Blues”, and “Yesterdays”.